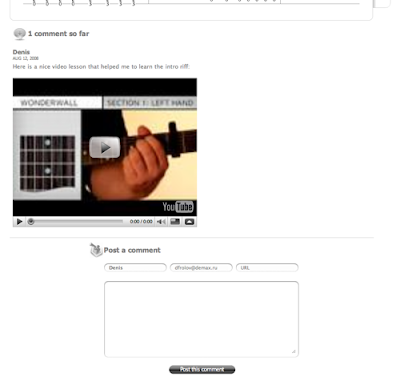 Stan Schroeder from Mashable compares Songsterr to Guitar Pro in his "Songsterr Makes Learning Guitar Tabs Easier"
Thanks to both authors for writing about us. We've got a lot of new feedback from readers of these posts and now have a better picture of what features to add in the upcoming release. We would also like to know your opinion on the social features mentioned by Stan. Friends, recommendations, forums? What do you think is missing in Songsterr? Today we released quite a few major features you've been waiting for. Not sure what does A7sus4 look like? Chord Boxes and Guitar Tuning Hints are here to help. Have something to say about a particular tab? Post a comment! Enjoy! More exciting stuff is on the way. We've released new version of Songsterr less than a week ago and it has already been visited by more than 50,000 people from all over the world. Thanks for all your feedback, feature requests and comments! We really appreciate that. Just added songs RSS feed. Half-speed playback seemed to be the most frequently requested feature and we think it will be very helpful for novice players. 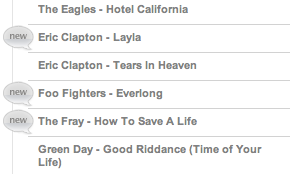 As promised, we continue to add new songs every day. Stay tuned and thanks again for your feedback! 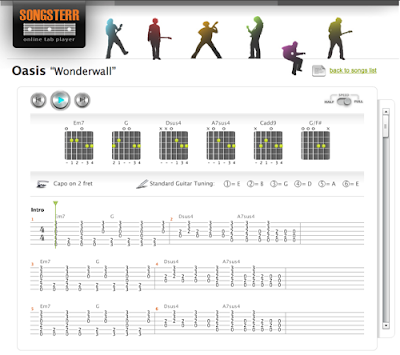 Songsterr is an online guitar tab player that solves the biggest problem of guitar tabs (absence of information on rhythm and duration) and allows one to actually listen to the guitar tab played by a realistic guitar engine.